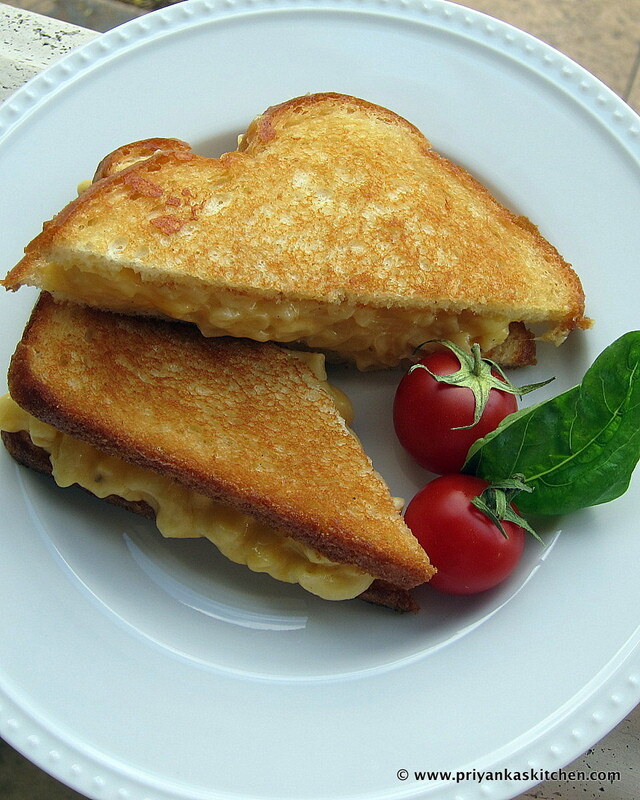 Mac ‘n Cheese Grilled Cheese! I eat copious amounts of cheese in my life, and my goodness this dish hits the spot for me. 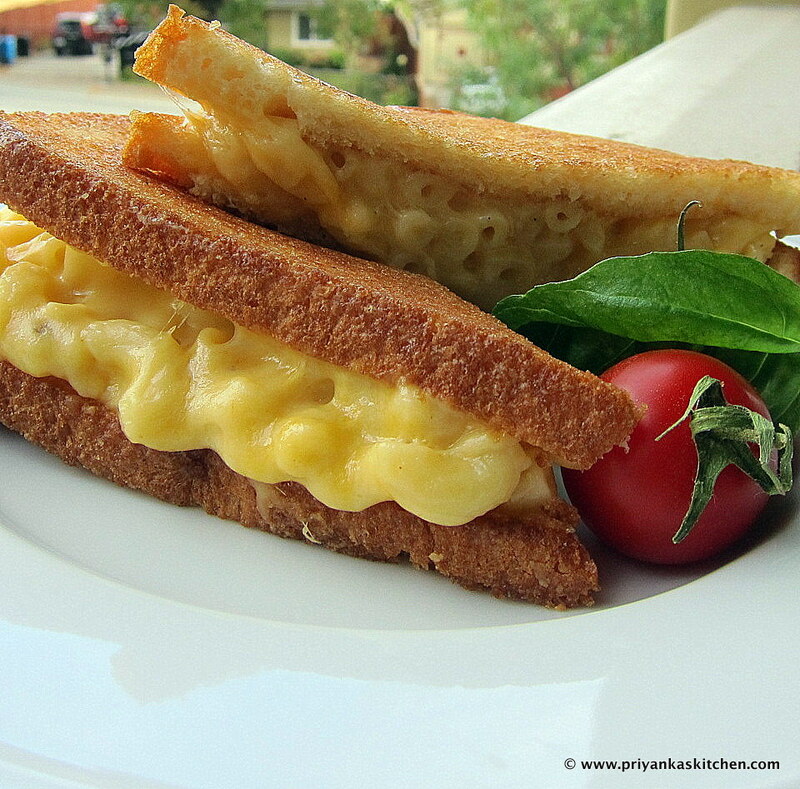 When served fresh off the skillet, the hot, fresh, and cheesy mac and cheese coupled with perfectly double-crisped buttermilk bread (I brown BOTH sides of each slice so that it is extra crunchy) transports me to my childhood in one, heavenly bite. Cover a large pot of salted water and bring to a boil. Add uncooked elbow macaroni and cook according to directions until cooked the way you like to eat them (do not under cook!). Drain well in a colander. While the pasta is hot, mix it with the cheese and bechamel sauce. Taste and add salt and pepper as desired. Heat a skillet over medium heat. Once hot, melt butter and put both slices of bread on skillet. Allow the side that is down to brown to the way you like it. Now flip the bread slices and add a little more butter, if desired. Load one of the browned sides with your hot macaroni and cheese and top with the other slice, browned side on the INSIDE of the sandwich. Continue to cook the sandwich over low to medium heat until the outside of the bread slices are browned to your perfection. This dish is beautiful, vegetarian (although you can always add grilled or rotisserie chicken to it for added protein), and simply decadent. Kids love it, parents love it, and your guests will be WOW-ed and think you slaved over this home-made sauce (don’t worry, I’ll keep your secret ;-))…. 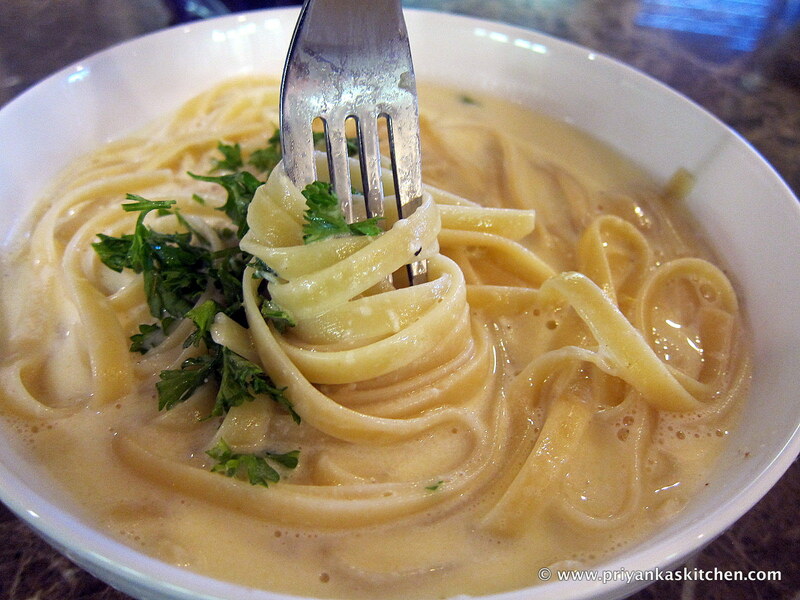 Prepare the Alfredo sauce by heating up the cream and butter in a small saucepan on low to medium heat. Use a metal whisk and stir occasionally until the butter is melted and well incorporated. Take off heat and whisk in the cheese, black pepper, nutmeg, lemon zest and juice until well incorporated. (Note: If your sauce is too runny, continue to cook over low heat until it thickens, whisking occasionally). Taste test the sauce and decide if you want to add salt or not (usually the cheese adds enough saltiness, but you can decide!). Meanwhile, prepare your pasta per package directions and drain. 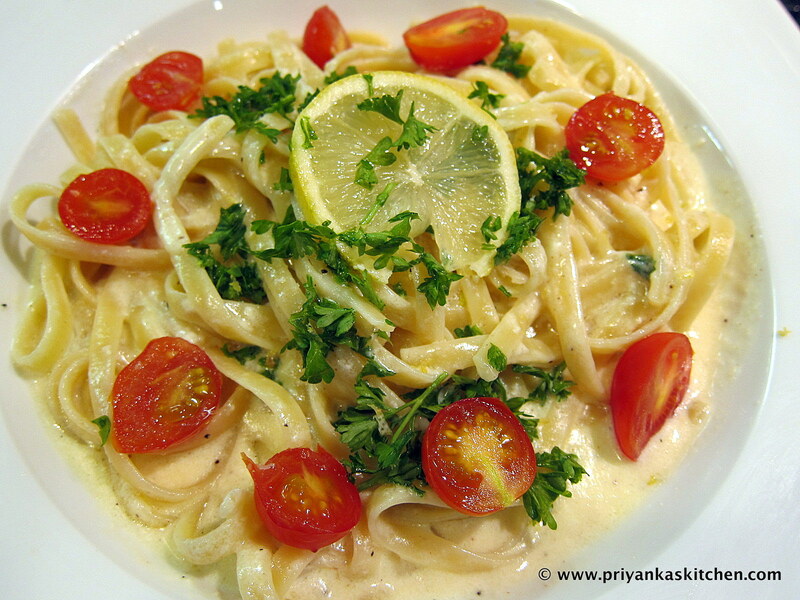 Pour sauced pasta into your serving bowl and garnish with halved cherry tomatoes, freshly chopped parsley, and drizzle the reserved lemon juice on top. Fresh pasta is such a luxury that I know that I seek it out specifically when I crave it and know exactly which Italian restaurants in the area make fresh pasta daily. You can really taste the difference in the taste when you compare dried, packaged pasta to fresh pasta. My husband and I went on our honeymoon to Italy a few years ago, and man oh man was I rapidly spoiled by the beautiful, perfect pasta in both Florence and Rome! Pasta dough is not easy to make (it takes practice to perfect it), but if you don’t mind the few steps it takes, I promise you it is WELL worth it! The results will astonish you. Believe it or not, fresh pasta takes only a few minutes to cook in boiling water (as opposed to 8-12 minutes for packaged pasta!). I have made so many different pasta forms from this dough recipe and enjoyed them all: tagliatelle, raviolis with different fillings, spaghetti, macaroni, rigatoni, you name it! 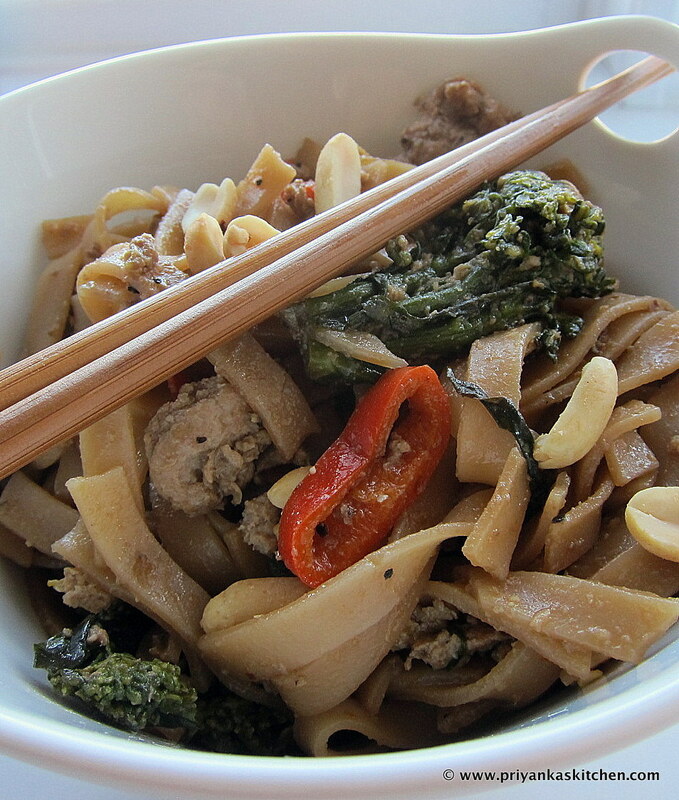 However, for today’s recipe, I will keep it simple and provide only the pasta dough recipe. This will become the base for many pasta recipes that I will share in the near future (hint hint 😉 ). I really do hope many of you try this pasta recipe out. 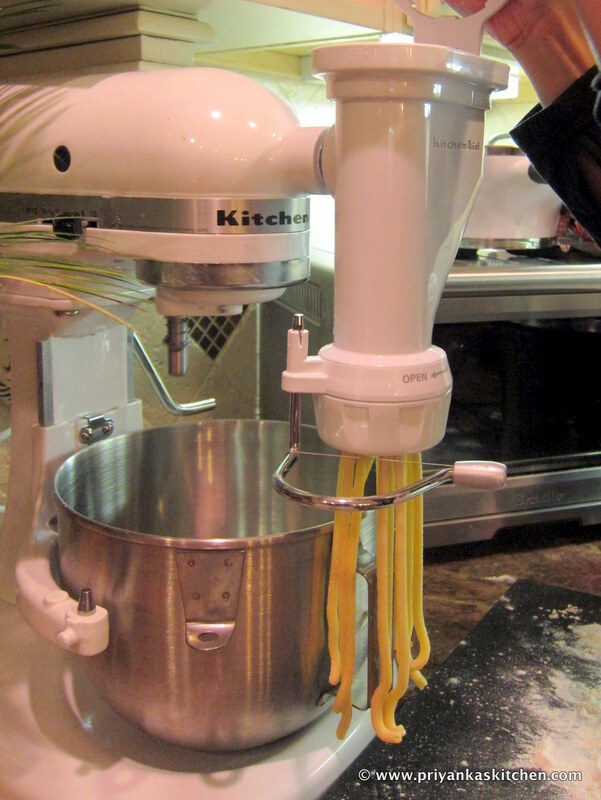 It is only one way out of MANY ways to make pasta dough (e.g. there is a 7-egg pasta dough recipe out there on the internet, and many chefs differ on the flour-to-egg-ratio that they like for their dough). However, this recipe has worked well for me. In an electric mixer fitted with a dough hook, combine the flour and salt. Add the eggs, 1 at a time (this allows the dough to incorporate the moisture from the eggs evenly and also avoids making it lumpy). Once all the eggs are well-incorporated, drizzle in 2 tablespoons of the olive oil (make sure it’s extra-virgin!) and continue to incorporate all the flour until it forms a ball. Sprinkle some flour on work surface, knead and fold the dough until smooth. Brush the surface with the remaining olive oil and wrap the dough in plastic wrap; let rest for about 30 minutes to allow the gluten to relax. Roll/ form as desired. Wash your hands! 🙂 Now, mound the flour in the center of a large wooden cutting board (or on a large countertop that you don’t mind getting a bit messy ;-)). 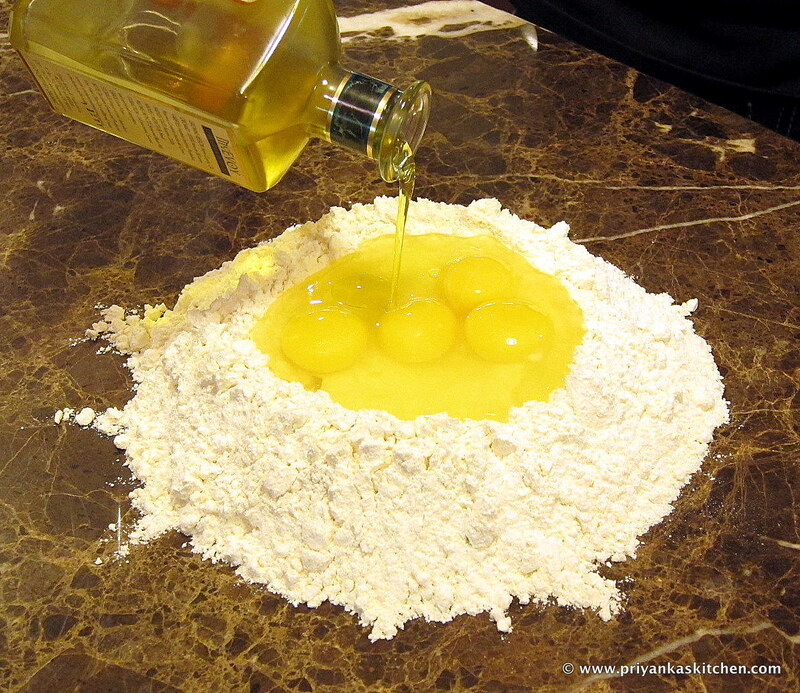 Make a well in the middle of the flour, add the eggs, salt, and 2 tablespoons of the olive oil into the well (see pic above). Using a fork, beat together the eggs and begin to incorporate the flour starting with the inner rim of the well. As you incorporate the eggs, keep pushing the flour up to retain the well shape. Note: don’t worry if it starts to get a little messy! Start kneading the dough with both hands. If you feel like the dough is too sticky and too wet, add more flour, in 1/2-cup increments, until you have a firm, smooth ball of dough. The dough should be elastic and a little sticky. Continue to knead for another 3 minutes (and remember to dust your board with flour, otherwise your dough will stick!). Remember, practice makes perfect so don’t worry if it’s not perfect your first few times. Brush your dough with the remaining olive oil and wrap the dough in plastic wrap and set aside for 30 minutes at room temperature to let the glutens rest. Roll/ form as desired. 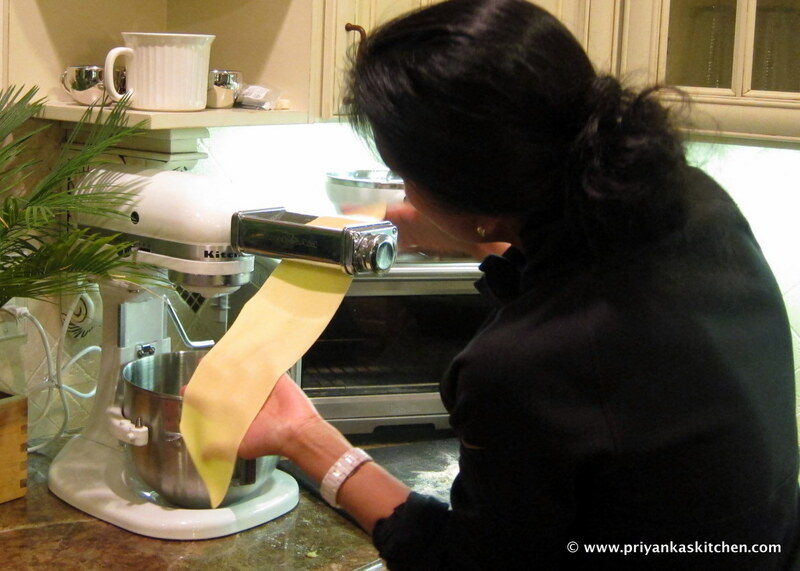 Here are two pictures of: a) rolling pasta out for ravioli with my pasta roller attachment and b) making fresh bucatini with my pasta attachment !